Benjamin J. Smith is a certified Physician Assistant by the National Commission on Certification of Physician Assistants. He is employed by Florida State University College of Medicine School of Physician Assistant Practice working clinically at the McIntosh Clinic, P.C. in rheumatology and lives in Thomasville, GA. He is a member of the ABIM Rheumatology Board. I wanted to become a physician assistant (PA) because of the opportunity to serve many people and because medical science fascinates me. What’s the best advice you’ve received as a PA? My supervising physician, Victor M. McMillan, has taught me to always be ready to learn the art of medicine. Be humble so that learning can occur throughout a career. I am most proud of the times when a patient reaches out to offer a big hug of gratitude. I am also proud of being the first PA to serve as President of the Association of Rheumatology Health Professionals, a division of the American College of Rheumatology. It was a rewarding and fulfilling opportunity. I enjoy sharing how patients incorporate ingenuity to maintain function. Working with those who have chronic conditions lends itself to people doing everything they can to remain functional. I have been impressed by how people modify their shoes, braces, canes and other assistive devices to help themselves. I believe the work that we do through volunteering makes a difference. I would encourage others to join ABIM governance because service brings much satisfaction. Giving back is needed and the current governance structure provides opportunity for private practice providers like me to participate. Working with ABIM, its leadership, staff and other volunteers does make a positive difference. How would you describe your experience of joining and serving on the ABIM Rheumatology Board? Before I joined an ABIM board, I didn’t have a full understanding of the depth of science related to testing. Psychometrics is tremendously interesting. After joining, I learned ABIM is diligently and genuinely serving the needs of internists, internal medicine specialists and the public to maintain the standards that we all hold in high esteem when thinking about doctors. I have met many other health professionals devoted to the mission and vision of ABIM. Serving and representing fellow health professional colleagues. 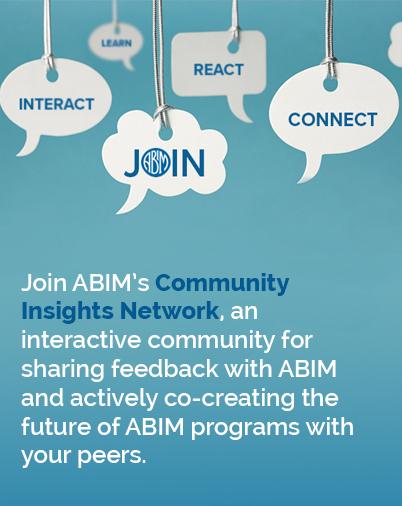 On numerous occasions while working in the clinic and hospital setting, I have had the privilege of providing insights and getting the word out regarding ABIM activities. It is refreshing to provide updates and knowledge to the health care community in which I work. The most challenging thing about serving is the opportunity to clarify misconceptions about ABIM. I speak Portuguese, which I learned while living in Brazil doing missionary work for two years. Although I had yet to complete my training as a PA when I lived in Brazil, I did see how the Brazilian healthcare system functioned on numerous occasions. I’d like to return to Brazil at some point in my life, and I always welcome opportunities to develop my Portuguese speaking skills. Aside from medicine, I am also interested in baseball, golf, family history and my family.